The US-North Korean joint declaration concluded between US President Donald Trump and North Korean leader, Kim Jong-un has raised the prospects of peace and reconciliation in the Korean peninsula, but has also thrown up some challenges for the region. There is hope that the historic meeting would bring an end to seven-decade long conflict. A 13-second handshake between two leaders who were hurling insults and making nuclear threats just six months ago began the historic meeting. Though Trump described the joint declaration as a comprehensive document, the text of the document is vague, and repeats issues that have been agreed to in earlier negotiations. But it is the comments made by the two leaders that add to the importance of the joint declaration. The broad commitments have been made, which set the track for detailed negotiations. 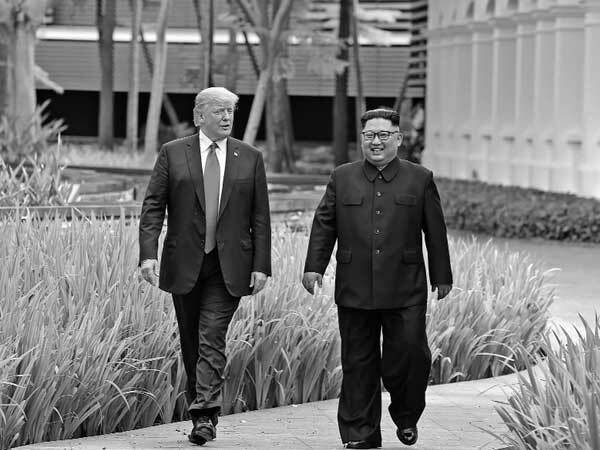 While Trump gave security guarantees to North Korea, Kim reaffirmed his commitment to working towards the complete denuclearisation of the Korean peninsula. There was however, no timeline decided for the denuclearisation, nor what the term actually meant. In his remarks, Trump said that Kim had agreed to begin winding down some missile facilities. North Korea has used the term ‘denuclearisation of the Korean peninsula’ during earlier rounds of negotiations to indicate denuclearization of North Korea and South Korea, which has the protection of the American nuclear umbrella. It was the major concession to North Korea that Trump made at his press conference when he talked of unilaterally ending US-South Korea military exercises that has several implications for the region. For the East Asian region it raises questions about American intentions as it evoked the possibility of US withdrawal from Asia. The military exercises have often rattled North Korea but Trump said they were “very expensive and paid for by the US.” It is in line with his view that US allies should pay for their security but it left the South Koreans bemused. Trump also said that he wanted to bring home the US troops stationed in South Korea. It was an issue he had raised during his presidential campaign and return of American soldiers would play well with his supporters. There was agreement on repatriation of the remains of the estimated 5300 American soldiers and prisoners of war. Repatriation of the bodies that have been identified could be implemented at an early date; it would be an emotional issue in the US and a huge boost for Trump’s image. South Korea welcomed the outcome of the meeting, though South Korean President Moon Jae-in acknowledged there could be difficulties ahead. China has been the most positive about the outcome of the meeting, Chinese Foreign Minister Yang Li saying “this is the goal we have hoped for and have been working for." China has also suggested that sanctions against North Korea can be lifted once Pyongyang respects the UN resolutions. Beijing had been uneasy with the sudden developments between the US and North Korea and will continue to keep a close watch on further developments. America’s closest ally in the region, Japan has been left out of the agreement even though it has serious concerns over North Korea’s threatening ways. It concerns over Japanese men and women abducted by North Korean agents during the cold war were not addressed even through Trump reportedly assured Japanese Prime Minister Shinzo Abe in a recent phone conversation that he would take up the issue. Kim has turned out to be a master strategist to Trump’s deal-making. After hectic period of missile and nuclear testing and heated rhetoric through 2017, Kim abruptly switched to a charm offensive in January sending a team to the Winter Olympics in South Korea and a few months later crossing the Panmunjom border for a euphoric meeting with South Korean President Moon Jae-in. Moon has been a strong advocate for dialogue with North Korea and the successful meeting created the conditions for a meeting with Trump. North Korea had been feeling the heat from the economic sanctions, especially after Washington had persuaded Beijing, Pyongyang’s main ally to enforce restrictions on North Korea. Washington had to tweak policies to contain North Korea’s intercontinental ballistic missiles, which threatened the US. Trump, who prides himself for his deal making abilities, required a major foreign policy success as he upended traditional policies and upset America’s friends and allies. Kim has come out of the cold with the face-to-face meeting with the US President. Pyongyang can be expected to make initial concessions to keep the negotiations going. It needs economic development and Seoul would be willing to provide economic assistance as ties improve and sanctions are eased. A process has begun in Singapore; it could be a long drawn process, bringing new twists and challenges, even change political equations in the region but it has sharply reduced tensions over the Korean issue. Lower income class taxpayers took the centrestage in the Interim Budget 2019-20 presented by the Finance Minister Piyush Goyal with significant relief being granted in direct taxes. Budget Special: Did You Know?